Are you looking for ideas for alternative wedding dresses? No doubt, you are the type of bride who rejects the traditional wedding dress with the full skirt and long train. 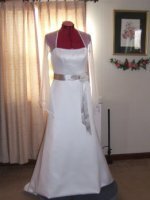 Maybe you like the look of a traditional wedding gown, but are interested in one that is in a non-traditional color. Perhaps you don't want a gown at all but some other outfit! Where can you find the perfect wedding outfit? Check out these ideas of where you can find your dress? These are some sources for finding non-traditional wedding dresses. Some you may have thought about and others may not have. Wedding Suit This is a good choice if you are having an informal type wedding like in a home setting or for court house weddings. Evening Gowns You can find beautiful gowns in the evening collection to use as a wedding dress. What's nice about using evening dresses is that they come in an array of designs and colors, even white and ivory. If you don't want a train or very little train, this is the best choice. Also they cost less than informal bridal gowns. Prom and Pageant Dresses Yes I put this category here. Why? Well some of the gown styles will work to use as a wedding dress. Especially if you are a bride who like unique wedding dresses, and a lot of glitz and glam. These can also be used for reception dresses. Mother Of The Bride Gowns There are some designers who design very stylish mother's dresses. If you are a mature bride who doesn't want the traditional wedding dress, this can be a great choice for you! These dresses typically come with wraps or jackets. They also have designs with sleeves if you are not into the strapless neckline look. Bridesmaids Gowns Some brides have found their wedding gown this way. Some designers make available bridesmaids dresses in white and ivory. Unique Wedding Dresses. You have a unique personality or a unique sense of style, so your gown has to represent that part of you in some way. Finding the perfect dress for you will not be easy but believe me, if you look hard enough you will find it! Pants Suit A great alternative wedding dress outfit for an informal wedding. Use as a reception outfit, for a Vegas wedding or if you are getting married on a yacht or cruise ship. Design your own wedding dress If you can't find what you want, then design it and have it made by a wedding dressmaker or tailor. Best to use a local sewing professional. But if you can't find someone local then search for an online source. Colored Wedding Dresses. A popular alternative to the traditional white or ivory bridal gown is choosing a colored wedding gown or a wedding dress with color added in a sash or detail trimming on the gown. One of the most popular sought after colors right now are red, black and blush pink wedding dresses. You may be looking for wedding attire that reflect an ethnic theme. Some popular choices are African, Asian and Indian wedding attire. Check to see if there is a shop in your local community that sell the bridal attire you want. Some outfits are very involved when it comes to putting it on, so if you buy from a shop they will show you how to wear your bridal outfit. You can also find ethnic wedding attire online. Just make sure the source you are buying from is legit and have a good return policy. In my alterations business I have seen brides use all of these ideas for non- traditional alternative wedding dresses. So take a look at some of these sources. You might be surprised at what you will find! When should you wear a non-traditional wedding dress?